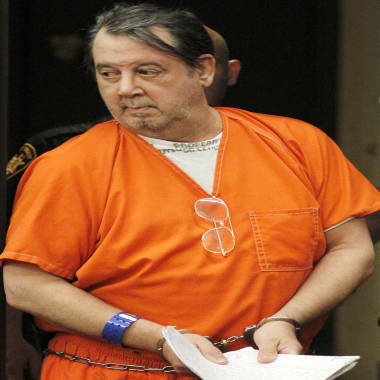 Bobby Thompson, who a federal marshal says is John Donald Cody, appears at a hearing in Cuyahoga County Court in Cleveland, May 8, 2012. When he was arrested on April 30, the suspect known as Bobby Thompson had been on the run for nearly two years from charges that he ran a bogus charity that collected millions of dollars from people who thought they were helping out Navy veterans. On Monday, federal authorities revealed that Thompson is really John Donald Cody, 65, a 1972 Harvard Law School graduate and Army veteran the FBI had long sought on numerous fraud charges related to a 1987 espionage probe. U.S. Marshal Peter Elliott, head of the task force that found Thompson, said on Monday that he was doing Google searches for fugitives recently when landed on an old FBI wanted poster for Cody. Elliot noticed the man's resemblance to the suspect marshals had nabbed in the Ohio fraud case. Cody, it turned out, had been charged but never arrested, so his fingerprints were not included in a nationwide FBI print database, the Cleveland Plain Dealer reported on its website. By obtaining Cody’s fingerprints from the Defense Department, Elliott was able to compare them with the prints taken after Thompson’s arrest. The suspect had served as a captain in U.S. military intelligence, Elliott said. “Thank goodness for Google,” Elliott said in a news conference Monday announcing Thompson’s apparent unmasking, the Plain Dealer reported. "This is definitely John Donald Cody," Elliott said. "He's a guy that thought, No. 1, he could never get caught, and No. 2, he would never be identified. And we were able to do both." Cody graduated from the University of Virginia in 1969 and Harvard Law School in 1972 and practiced law in several states, Elliott said. Harvard confirmed to The Associated Press that a John Cody graduated from its law school in 1972. The suspect known as Bobby Thompson was featured on television as one of “America’s Most Wanted” fugitives. He surrendered after a tip led to a Portland bar and marshals followed him home. Thompson is now jailed in Cuyahoga County, Ohio, charged with 22 counts of theft, money laundering, tampering with records, engaging in corrupt activity and other charges. He ran the national charity out of Tampa, Fla., with fake officers and state chapters and opened up numerous bank accounts and rented mailboxes to pull of the scheme, according to Ohio authorities. An associate of Thompson’s, Blanca Contreras, of Tampa, Fla., was sentenced to five years in prison in August, 2011, in connection with the charity scam. Thompson’s attorney, Joseph Patituce, told The Associated Press he is preparing for a March 11 trial. "We believe that the state has a very weak case against our client, but we look forward to our day in court," he said. According to authorities, little of the money collected to benefit veterans through the U.S. Navy Veterans Association was used for that purpose. However, thousands of dollars was contributed to political candidates.